That’s literally all it has. Cilantro and Mint. 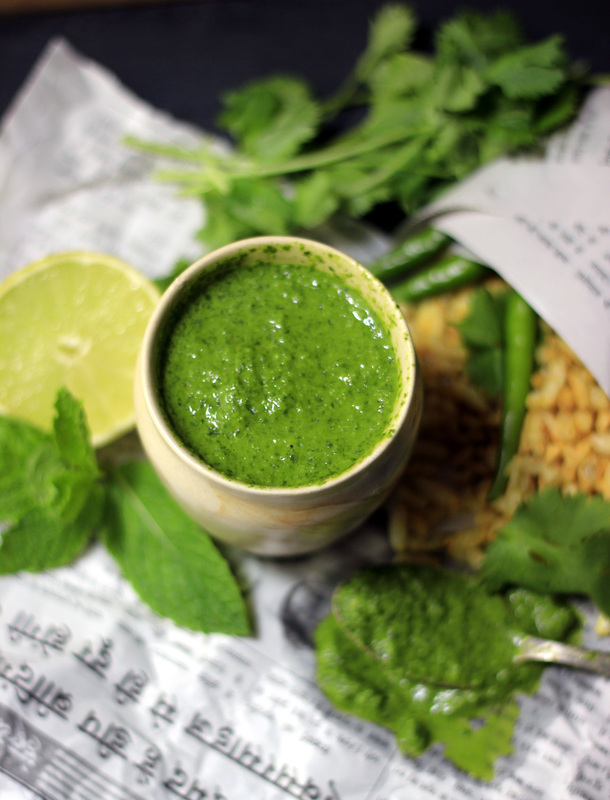 The Green chutney base for most street food served in India and Indian restaurants abroad. Samosa, Bhel, Chaat to name few. My mouth is watering just thinking about these roadside treats. Living in United States Bhavin and I miss these quintessential, yummy food served till late night only a drive away. Friends turned in to life partners we share foodie interest since our school days. Like any local food lover we knew where to go for which particular street food. And we would drive from one end of the city to another for that food from that place. Do you remember when the last time you drove longer than going to work for something that special? And well, some of our friends shared that same craziness with us and now whenever we visit home we do good food hopping together. You probably guessed right so to make any of these items at home first and foremost I will need to make this green chutney. Here I have my version of cilantro & mint chutney based on my memories of having them at different part of city and the one that works best for sandwich that I will making after preparing this chutney. I grew up eating this green chutney as side with meal. We almost call it green ketchup as anything that can be served with ketchup can be served with this chutney too. Growing up we always had this handy. Its our way of getting green in diet, or almost. Although mom had different recipe and I have found mine slightly different the idea behind having it ready in the refrigerator is the same as having it handy for when that craving strikes. Will cover mom’s recipe soon along with couple of her specials which I long for. Place all the ingredients in the blender except oil. Add oil little at a time while blending. Blend until its like pesto consistency. Depending upon the type of blender you might have to adjust the quantity of liquid to get the job done. You may need more oil if the blender is slow or vice versa. Oil can be totally replaced with water if you are going to consume chutney on same day. What I have found however just like pesto adding oil for blending in this chutney helps retain the color, taste and integrity. And because using oil instead of traditionally made with water it doesn’t separate or taste soupy as most people I have heard complaining about cilantro having funny taste sometime. Above all it works best for sandwiches as it doesn’t make the bread soggy. It stays well for a week in the refrigerator in a tight jar. Freeze an extra batch or if you prepare ahead for entertaining and serve with Samosa, Bhel, Chaat, Paratha just about anything savory.